Creating a strong image that holds visual appeal requires many components working together, including an interesting subject, lighting, focus and depth of field. One of the most important elements in a good image is composition, which unfortunately, isn’t a straightforward science. While composition has some general rules, it involves the photographers’ artistic involvement and can be very subjective. 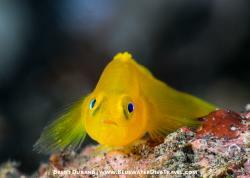 As underwater photographers we bring the element of diving to our photography, making it even more challenging. Not only are we now trying to use the perfect settings for our shot, but we must keep track of strobe placement, watch our buoyancy, check our gauges and follow the divemaster – all in addition to composing the shot through a mask and a tiny viewfinder! For shooting wide-angle and big animals there are several things that can help with composition and capturing a strong, appealing image. Be aware of what the background in your shots will contain. Don’t only pay attention to your subjects, but understand what may be distracting or could enhance your shots. A sure way to help a subject pop is to get close and have nothing but clear blue water surrounding it. 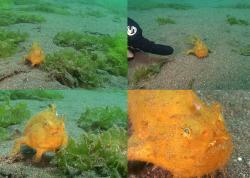 Likewise, a sandy bottom can work in conjunction with your subject as a great background. 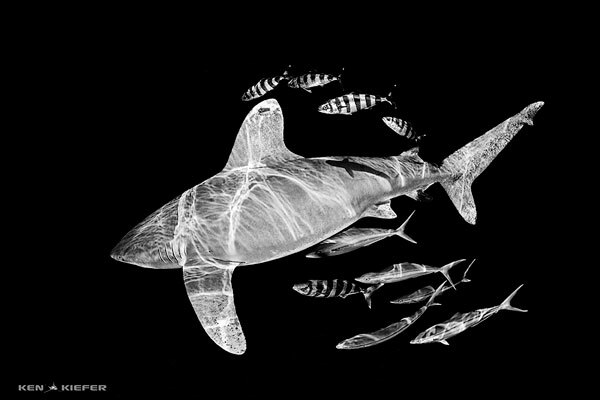 The incredible blues of the deep ocean surrounding Cat Island provides an amazing backdrop for the sun’s rays over this oceanic whitetip. 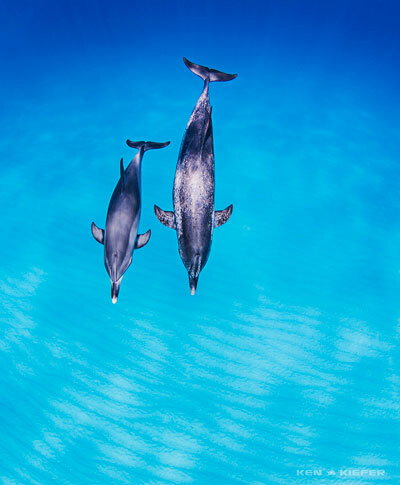 This mother and daughter Atlantic Spotted Dolphin glide through the clear Bahamian waters over a beautiful white sand background. Subjects that trend towards the diagonals of the frame, either through position or patterns help catch the eye and provide a good balance to an image. Combining a diagonal with the horizon line of the water surface or sea bottom is also a helpful technique. The placement of horizon lines is important as well, relating to the important Rule of Thirds concept. Generally, you want the portion of the image with the most interest to be in the 2/3 area of the image. 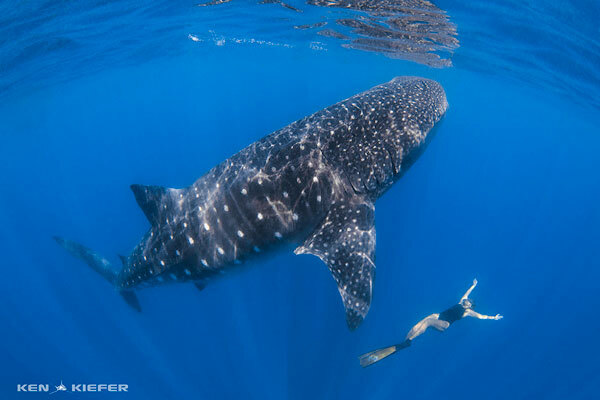 While in Isla Mujeres, my freediver buddy mimics this whale shark as it begins to go vertical to gulp in large amounts of fish eggs. 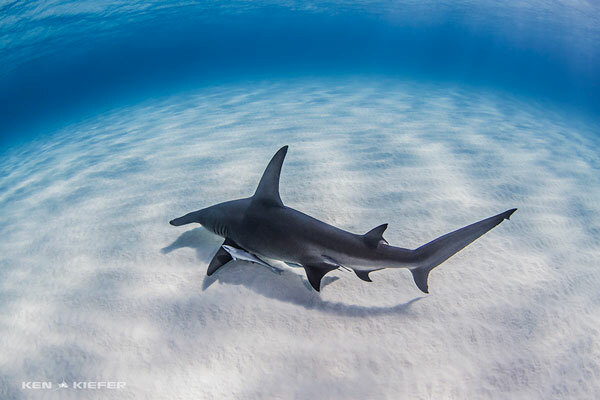 This lone Great Hammerhead shark glides over a perfect background of white sand. Pay attention to animal tendencies and direction of the sunlight to help put you in the best position when possible. Sometimes you may want the sun directly in your face to get a silhouette or sunball shot. Other times you want the best clarity and contrast from having the sun at your back. 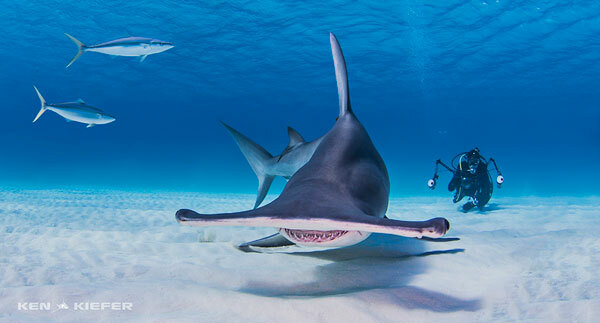 Some of these options aren’t available to you on every dive, but keeping your options in mind on every dive will enhance your photo composition opportunities. I tried for this shot for a week before it finally happened. A split second after I snapped this shot, the cephalofoil of the hammer banged into my dome port! 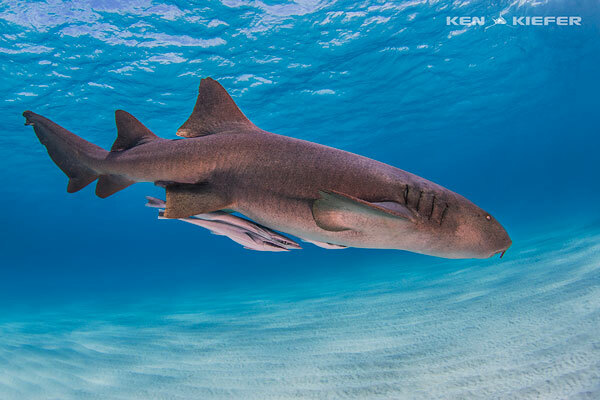 This Nurse Shark creates a great diagonal line with the horizon lines of the water’s surface and the sandy bottom. I watched her approach the surface and then dive several times and was able to move into position to capture this action. Don’t put on blinders that may keep you from missing a great opportunity. It’s great to have a ‘shot sheet’ of looks and angles that you want to accomplish, but keep an open mind and watchful eye so that you are ready for other options, fast actions and unique behaviors. 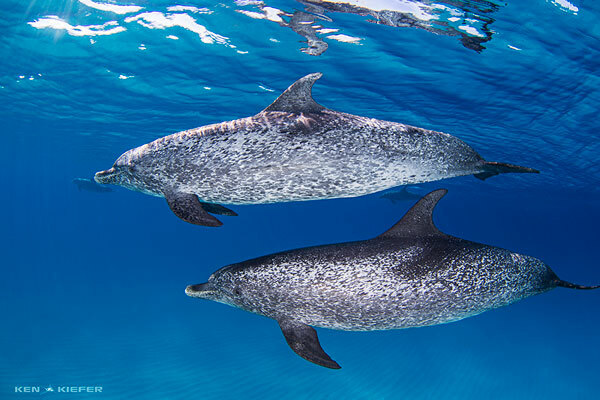 I was chasing my wife and a pair of dolphins trying to get a shot of them together, when I saw this pair of males out of the corner of my eye. I readjusted quickly and was able to frame them for a quick shot. 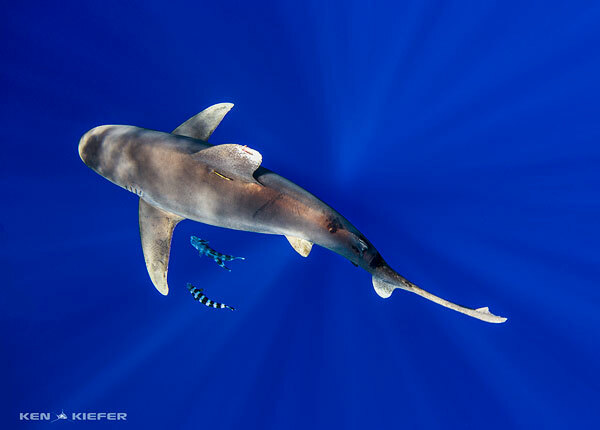 This oceanic whitetip was swimming near me with nothing in sight but deep blue ocean. I love the shot in color, but using the black and white adjustment tool allowed me to make the blue into black and further isolate the subject. I’ve heard many photographers complain about inconsiderate divers ‘ruining their shot’ by not paying attention and just swimming around without considering other divers. 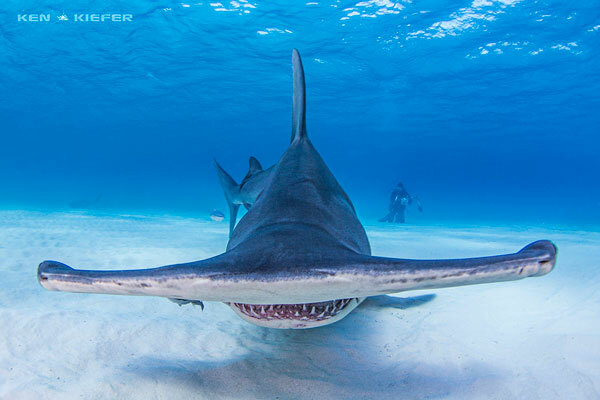 This can sometimes be a problem, but when it can’t be avoided, look for ways to incorporate divers into a shot to provide scale and as a way to balance the composition. My dive buddy was in a good position to balance out this shot. 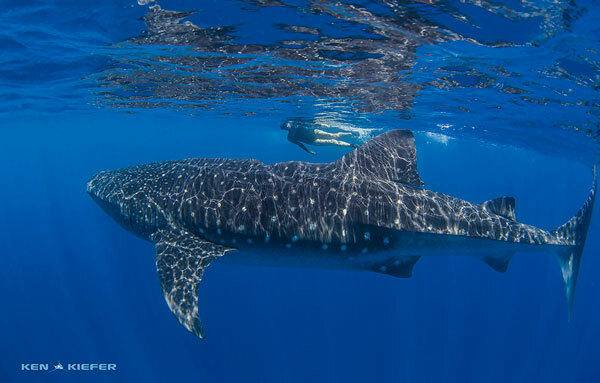 This was the first whale shark that my wife and I ever encountered. It has a huge gouge from a propeller that has healed over. 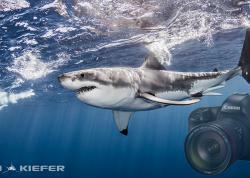 Having her in the shot provided a great way to judge the size of the shark. One of my favorite ways to bring out the intensity of an image is through the use of black and white. 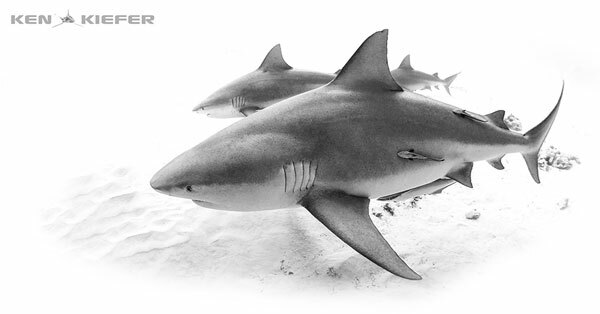 Black and white can help simplify an image to bring out the essential subjects. 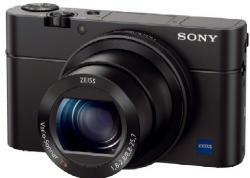 It can also add great drama and clarity. Shooting with black and white in mind helps focus my thoughts and eye for composition towards the key ingredients for a strong image, including background clutter. 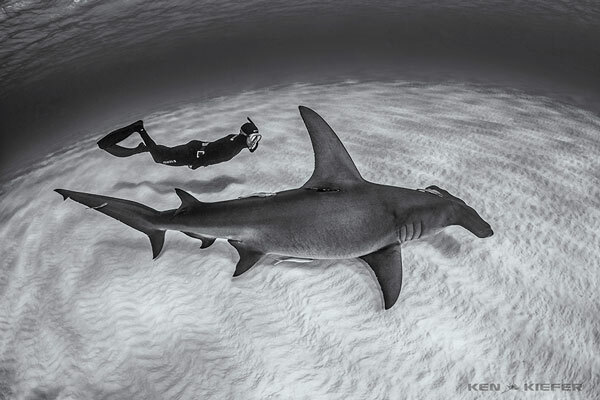 The Freediver provides a wonderful balance to the hammerhead and making the image black and white adds drama and contrast.